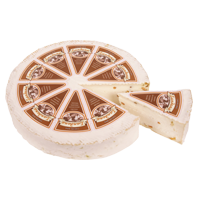 Landana Chèvre Brie FENUGREEK has a slightly creamy, fresh yet spicy flavor. Thanks to the solid consistency of the Brie it is easy to cut into wedges. Fenugreek is an annual herb with thin pods containing many light-brown seeds. The seed has a highly characteristic flavor and also provides a yellow coloring which is found in the brie around the fenugreek seeds. Landana Chèvre Brie tastes superb on toast or bread with a good glass of wine, as part of a cheeseboard and is wonderful when grilled on a piece of French bread. Pure pleasure! Landana Chèvre Brie FENUGREEK is gluten free by nature.